We’re located on the Kona Coast of the Big Island of Hawaii. The State of Hawaii includes six major islands: Oahu, Hawaii, Maui, Kauai, Molokai and Lanai. Inter-island travel is usually by commercial airline. Hawaii island (also called "the Big Island") has the largest land area. Kona is on the western side of Hawaii island (Honolulu and Waikiki Beach are located on Oahu, an entirely different island). We prefer to perform weddings on the Big Island where we live but we can travel to other islands by special arrangement. , call us at (808) 326-4192, or send a fax to (808) 329-8583, to discuss your plans. We can prepare your own personalized wedding ceremony with the information you provide to us. Congregation Kona Beth Shalom, located on the Kona Coast of Hawaii's "Big Island," is the only Jewish congregation in West Hawaii. It is unaffiliated and is open to meet with and learn from all Jewish resources. The Congregation serves the community and visitors with Shabbat Services on the fourth Friday evening and Saturday morning of each month as well as with observance and celebration of Jewish holidays throughout the year. Dr. Barry Blum was president of the congregation for over thirteen years and has conducted many of the services with the participation of other members and guests. 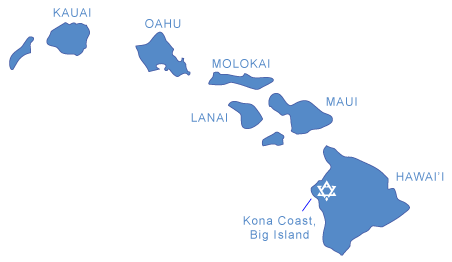 Kona Beth Shalom's web site has more information about Jewish activities on the Big Island. If you wish to have a ketubah we suggest you buy it well in advance on the mainland or through the internet. There are no Judaica stores on the Big Island. Lovely Hawaiian ketubot by Shayna Baecker Magid are available. Wherever you obtain your ketubah, ask your artist to fill it in before you bring it here. We can sign it in English or Hebrew at the ceremony. Click here for information about a Hawaii Marriage License or telephone (808) 974-6008. More information about Kona’s Traveling Jewish Wedding Band and the CD "Shaloha Oy." More information about The Golden Gate Gypsy Orchestra of America and California, and the CD/Cassette produced by Mickey Hart.